Bottom-rooted, aquatic perennial, with stems emerging above the water surface. Leaves feather-like, finely divided. Forms dense mats floating on the surface, or on damp ground. Occurs in shallow, still or slow-moving freshwater less than 2.5 m deep. Flowers Minute, without petals. Broadly-triangular white sepals 0.5 x 0.3 mm enclose the four-ribbed ovary. Female flowers solitary in the axils of aerial leaves. Male flowers (on different plants from the female flowers) not seen in NZ. Flowers Sep-Feb.
Fruit Not set in NZ. Leaves Pale bluish-green, up to 45 mm long by 15 mm wide, in whorls of five or six. Finely-divided into 25-30 awl-shaped leaflets, each up to 7 mm long. Stems Bluish-green, up to 5 mm in diameter. Up to 2 m long, emerging up to 10 cm above the surface. Submerged parts bare, with constricted nodes. Roots Appearing at the lower stem nodes. Shallow freshwater of peaty or organically rich swamps and drains, lake margins and slow-moving water. 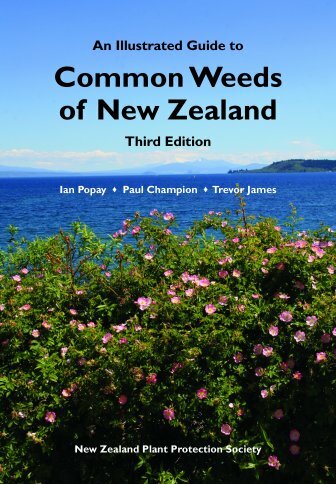 Locally common in scattered NI localities in Auckland, Waikato, Wairarapa and southern Manawatu. Originally from South America. 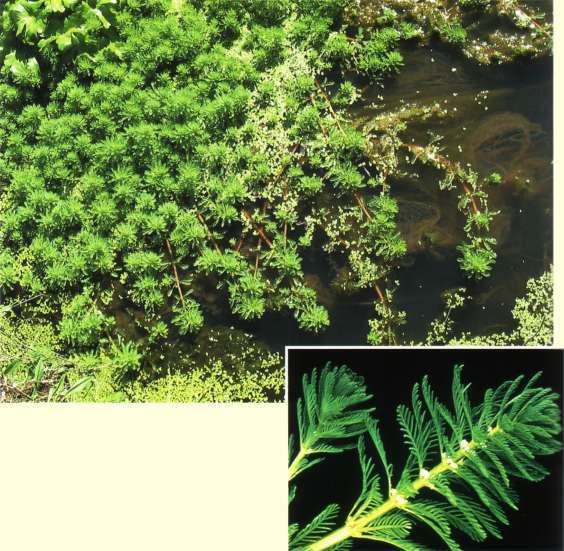 Myriophyllum (Gr.) = many leaves, referring to the finely divided leaves; aquaticum (Lat.) = growing in water.